I hear this often: “I don’t read Christian fiction. Those books are shallow and stupid and unrealistic. Real people aren’t like that.” Sadly, that’s often true. But now I have a two-word answer for that kind of complaint: Sally John. 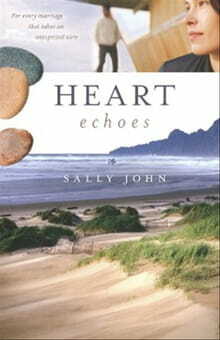 Heart Echoes, John’s latest offering, is anything but shallow or stupid. It’s a thoughtful, multi-layered look at the inner workings of a modern family and the secrets that threaten to tear them apart. Stuck on the interstate during a massive Los Angeles earthquake, lawyer Teal Morgan-Adams feels her world begin to crumble along with the overpass overhead. It was a good world, too—one Teal shares with her husband, River, and her sixteen-year-old daughter, Maiya. They’re a blended family bound together by love and mutual respect. Until . . .
River winds up in the hospital with injuries sustained in the quake . . .
Maiya turns up missing . . .
One of River’s former at-risk students is involved . . .
Then Maiya decides it’s time to find her biological father. Problem is, Teal never told her who he is. Teal never told anyone who he is. Not even him. The secret that shaped her life now threatens to tear it apart. Like many women, Teal tries (and often fails) to balance marriage, motherhood, and a demanding career. Her past is full of bad memories. Her relationship with her sister Lacey is complicated. Her home town is the last place on earth she wants to be. It takes a natural disaster and more than one family crisis to get Teal back to Oregon, but eventually she and Maiya end up on Lacey’s doorstep for the summer. Luckily, that’s exactly where God wants them. The thing that makes John’s writing so good is that every character rings true. They’re all complex, flawed individuals just trying to live their lives as best they can. After the heart-pounding beginning there’s not as much outer drama, but the internal tension ratchets up with every chapter. Unlike so many Christian novels that preach at the reader, John shows God at work in her characters’ lives without feeling the need for play-by-play commentary. Teal and River are neither super Christians nor lost souls; their relationships with God are authentic and believable. The publisher’s press release touts Heart Echoes as “a guide to helping marriages” but you don’t have to be married (or a parent) to appreciate this story. Teal, River, Maiya, Lacey, and the rest are engaging enough that you’ll be rooting for them from the very first page.